A female aged 42 years had eruptions in both legs since one year. 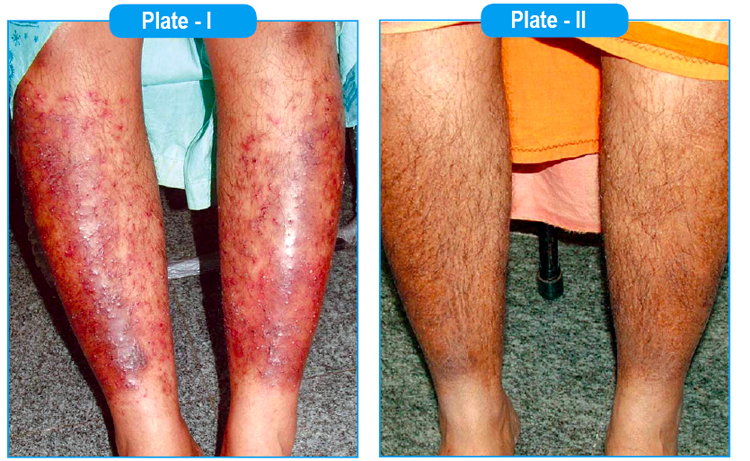 Initially she had mild itching in both, legs, later reddish rashes developed and eruptions appeared in both legs. Itching was severe < at night, emotions, travel, touch, winter. The lesions were oozing and the eruptions filled with pus occasionally. She had consulted a dermatologist, homoeopath and transferred to Chennai and was under treatment. Took Allopathic and Homoeopathic treatment for eczema. She is very calm by nature. Anxious and depressed easily. Affectionate and gentle in behaviour. Menstruating, Menarche at the age of 15th year. Periods are regular, 1-4 days, 26 to 28 days. Married, 2 daughters, Delivery is Normal. 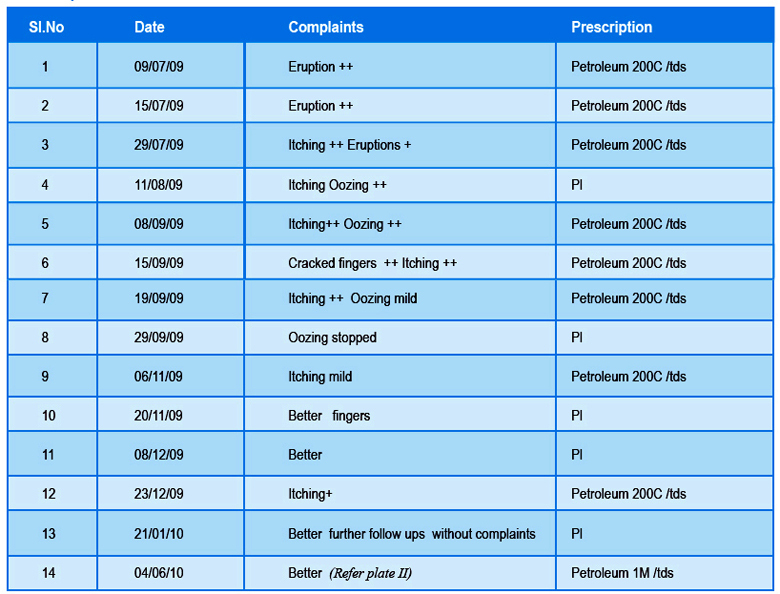 Petroleum was prescribed by understanding the psora sypthilitic changes in this case even though when other remedies are apparently similar to the presentation of the case. The surface miasm in this case is expressed by its characteristic discharges and its modalities. The syphilitic expression had been well tackled by the miasmatic drug which is finally concluded with psoric application for radical cure. The Antisoric drug expelled suppressive symptoms layer by layer and given complete recovery to the patient.